If you are looking for a vehicle that is smaller than a jeep, but more powerful that a standard side x side, the new 2009 Silverback is a vehicle to take note of. EMI is setting new standards for side x sides with cutting edge looks and features bringing a refreshing change to the old golf cart look-a-like UTV lineup. Engine: The Powerful, industry leading, Electronic Fuel Injected, 812cc, 3 cylinder, 12 valve, DOHC car engine produces over 52 horse power and launches the Silverback to a top speed of over 56 mph! This is not just another ATV engine. It is an extremely reliable and sophisticated engine with Siemen Injectors, Bosch ECU, Bosch Ignition Coils, Dual Over Head Cam, and Diagnostic Capabilities. Just plug it into a laptop and read all of the sensors for easy repairs. Chassis: An innovative SUV Chassis is light but very strong for on and off road use. Transmission: A sporty 4 speed manual transmission is used for superior control and performance when flying down a curvy dirt road or crawling up a steep, rock studded hill. Suspension: Dual A-Arm Idependent Suspension technology is used at all four corners for optimum handling and a smooth ride over rough terrain. Charging System: The Silverback comes standard with a 75 amp alternator. This is more than 2 or 3 times as much power as other UTVs on the market and is plenty of electrical power to run aftermarket lights, a stereo system, and any other aftermarket accessories. 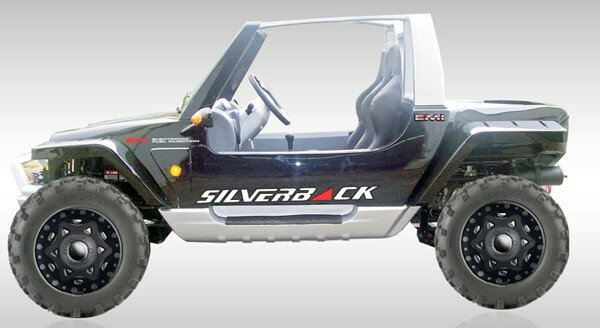 Interior and Other Standard Features: The interior of the Silverback is unlike any other UTV on the market. The interior resembles a car featuring a safety glass windshield, comfortable high back bucket seats, a console and dash board with guages, side mirors and turn signals…the list goes on and on. Based in Riverside California, Eminent Motorsports International(EMI) is focused on providing unique and innovative side x sides. EMI is setting new standards for side x sides with cutting edge looks and features bringing a refreshing change to the old golf cart look-a-like UTV line up. Emi currently offers the fun and stylish Silverback and will soon release the aggressive and sporty Howler.